Frome Town Council has produced Town Design Statement for Frome which outlines the important features of Frome to be protected and includes a number of guidelines relating to design. The Statement has been formally adopted by Mendip District Council as a supplementary planning document. The aim of the Frome Town Design Statement is to give a detailed guide to the character of the town, identify the specific nature of the buildings and landscape that make Frome distinctive and set out recommendations on how to encourage new development of high quality design that enhances and complements what already exists. It complements policies within the Adopted Mendip Local Plan Part I (2006 – 2029), specifically providing a more detailed framework to guide development in Frome, encouraging regeneration and enhancement as outlined in the Local Plan Core Policy 6: Frome Town Strategy. Additionally it seeks to provide further guidance on design in the Frome area, providing additional local guidance in line with Local Plan Core Policy DP7: Design and Amenity of New Development. 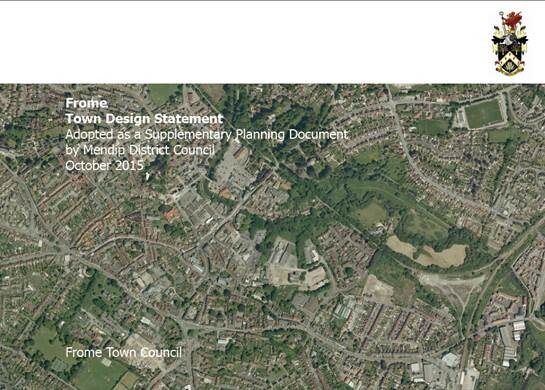 What does the Frome Town Design Statement Include? Quality of the Environment – visibility, scale, roof scapes, infill, density, parking. Landscape (soft and hard) – settlement edges, river corridor, green spaces, trees, boundaries, gardens, landscape schemes, lighting, signage, public art, open space. Building Design – lines, frontages, roves, materials, shop fronts. Conservation Area – Frome Conservation Area Appraisal and Management Proposals, Listed buildings. Sustainability – land use, siting of development, design, amenity spaces, flexibility, resource use, sustainable drainage. Movement and Transport – legibility and signage, pedestrian crossings, town centre ‘shared space’, accessibility, parking, traffic effects of development, pedestrian and cycle routes, Railway station gateway, public transport hub, gateways. Large Scale Development – development briefs, variety of house types, grouping of houses. General Development – local distinctiveness, settlement pattern, Design and Access Statement, building styles, innovative design, appropriate uses, demonstrating design quality, community involvement. It also identifies 27 character areas (in Section 6) and within each character area the distinctive features and main issues are identified, including things such as layout, landscape and open space, townscape and materials, as well as special features such as historic buildings. It also lists the general guidelines most applicable to the zone along with a number of zone specific guidelines.